(CN) – For the second time in under a week, the state of Hawaii has filed a motion requesting a federal judge clarify the scope of his March preliminary injunction that halted elements of President Donald Trump’s travel ban. The second motion, filed late Friday, came in direct response to a Ninth Circuit ruling that said U.S. District Court Judge Derek Watson, who issued the injunctive relief, had the authority to clarify the scope of that relief even though the case is pending in the U.S. Supreme Court. Hawaii Attorney General Doug Chin filed the motion on Friday asking Watson to narrowly define “close familial relationships,” while stipulating that federal agencies could not assume people from the six banned countries attempting to enter the United States do not have a “bona fide” relationship to people living here. “Plaintiffs therefore request that the court issue an order enforcing or modifying its preliminary injunction to reflect that the injunction bars the government from implementing the executive order against grandparents, grandchildren, brothers-in-law, sisters-in-law, aunts, uncles, nieces, nephews, and cousins of persons in the United States,” Chin wrote in the motion. Chin also wants Watson to prohibit the federal government from using a restrictive interpretation that prohibits travel to the United States for several different categories of individuals hailing from Yemen, Iran, Somalia, Libya, Sudan and Syria. He asked Watson to clarify that federal agencies must not presume an individual does not have a “bona fide” relationship to the United States. Watson issued a ruling Thursday saying it was not his role to interpret rulings of the U.S. Supreme Court and that he was not going to revisit the injunction in deference to the higher court, which has decided to take up the travel ban case. Hawaii immediately appealed the decision to the Ninth Circuit, which declined Friday to take up the appeal. But the appellate court did say Watson has the authority to revisit and revise his preliminary injunction. Hawaii’s lawyers, which include private attorney Neal Katyal, used this opportunity to ask Watson to revise his preliminary injunction which was largely overruled by the Supreme Court. Several appellate courts rejected bids by the Trump administration to reverse injunctions on the travel ban put in place by several federal judges after Trump crafted his first executive order on Jan. 27 and issued a revised version a month later. But the Supreme Court allowed the travel ban to be implemented by the federal government except in cases where an individual has a “bona fide” relationship to the United States. 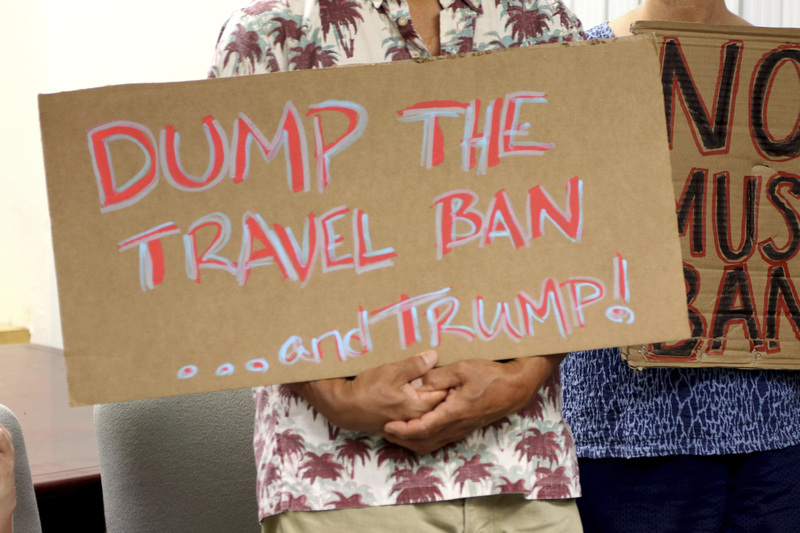 Hawaii and other entities opposed to the travel ban fear the interpretation applied by the Department of Homeland Security will be one that errs on the side of restriction, preventing family members from entering the country and visiting their children, grandchildren, spouses or relatives. On Monday morning, several states asked the court for permission to file amicus briefs in support of Hawaii’s position. The amicus brief was signed by attorneys generals from New York, California, Connecticut, Delaware, Illinois, Iowa, Maine, Maryland, Massachusetts, New Mexico, Oregon, Rhode Island, Vermont, Virginia, Washington state, and the District of Columbia.